Are you looking for a decoration that will delight you with colors and shapes? A motif that is both interesting and timeless? Something, that can fit every type of interior? If the answer is yes, your search have reached its end: orchid mural is everything you need. 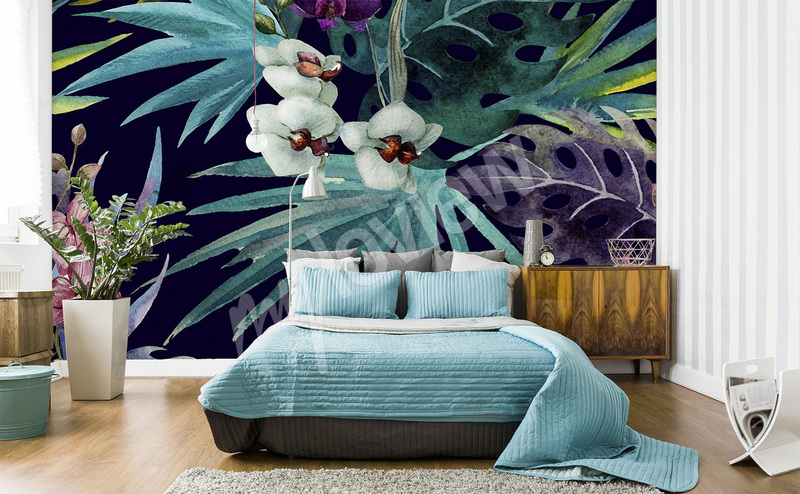 By choosing a fitting orchid mural motif, you can decorate every interior, both private and office one - and some motifs, like orchid 3d wallpaper, not only will decorate your space, but also will make it seem larger! Interested? Keep on reading: we have a couple of options that will help you apply those wonderful flower motifs into various types of interiors! Orchidaceae is one of the most common and numerous family of flowers. Orchids can be found in every climate - except for the extremely cold one. There’s no other plant in history that would cause so much excitement: in the past, there were actual orchid hunters that were professionally seeking new species of those wonderful flowers and bringing them back to Europe, where gardening and botany enthusiasts were waiting and longing for the newest specimen. Thankfully, we don’t have to hunt orchids anymore: orchid wallpaper is within arm’s reach of everyone who wants to use it as a decoration of their apartments! We can safely say that there’s not a single color that couldn’t be found among orchids: there are classic snow-white flowers, ones with unusual green shade, and even almost black ones. 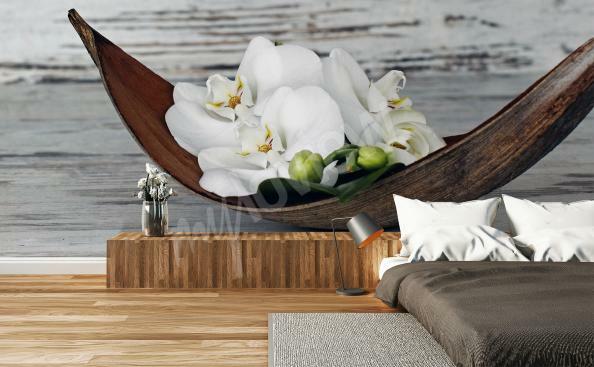 The amount of shapes is even bigger: some orchids look like regular flowers, while others resemble bees or small birds, or even tiny dancers in extensive tiered skirts… That’s why we’re sure that, no matter what color palette and character an interior has, you can find an orchid wall mural that will best fit it’s decor! And to avoid getting lost among the rich variety of designs, we’ve prepared for you a couple of suggestions. White flowers are both, the most classic and the most elegant among color variations - orchids are no exception. A mural with an image of a white orchid is one of the most popular orchid motifs and there’s no surprise as to why: it fits every interior and will bring a breath of sophistication anywhere it may be placed. No matter if you’re looking for a kitchen or hair salon decoration, white orchid wallpaper will be just as fitting. So, if you’re not sure which motif to choose, this one’s your answer. There are plenty of business interiors that will benefit from using an orchid wall mural as a space decoration. It’s easy to imagine it as a decorative element in an elegant restaurant (it’s another interior where white orchids will look absolutely stunning! ), luxurious beauty salon and modern cafe in minimalistic style. Our wall murals are a great choice for business interiors, as we create them with care for the highest durability and resistance to harmful factors. These features are provided by both, innovative technology of latex print that we use to create our prints, and carefully selected materials. This makes orchid mural a great solution for even the most “busy” of interiors! Are you looking for something truly unique? A mural + orchid combo (eBay and other internet stores will help you find the same kind as on the image) placed in some of the visible points of interior will surely make a great impression on your guests and clients! Do you want to make your interior seem much bigger than it actually is? 3d orchid wallpaper will help you make that happen! Thanks to the three-dimensional effect a wall on which you’ll apply the decoration will look farther away than it actually is, making the space look “bigger” at least in appearance - that will do the trick! Do you know which one is the most famous orchid in the world? No, we don’t mean any kind of flower-shop-wonder! It’s a plant - or its chemical equivalent - that you have a contact with almost every day without even realizing it. We’re talking about vanilla! It’s yellow flowers are surprisingly decorative. You can use their image with vanilla’s characteristic pods to decorate your kitchen. It’s a perfect idea for a subtle decoration, that will additionally show just how much you love sweets! A vanilla motif will also look great in a patisserie, bakery or cafe.